Fees: No entrance fee for Wharton State Forest. Batsto Village: Entrance fees are charged per vehicle from Memorial Day weekend to Labor Day. 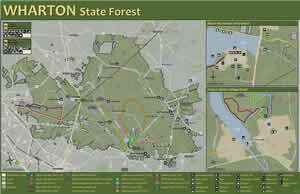 Wharton State Forest has two offices - one at Batsto Village and one at Atsion Recreation Area. Batsto Village is located on Route 542, eight miles east of Hammonton. Atsion is on Route 206, eight miles north of Hammonton. 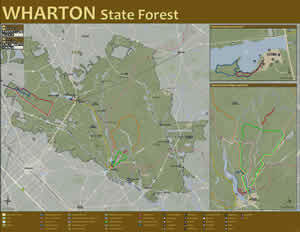 Wharton State Forest is the largest single tract of land within the New Jersey State Park System. It is also the site of Batsto Village, a former bog iron and glassmaking industrial center from 1766 to 1867 that currently reflects the agricultural and commercial enterprises that existed here during the late 19th century. The Atsion Office will have a delayed opening date for Spring 2019. For questions and for all camping permits, please visit or call the Batsto Office at (609) 561-0024. Batsto Office Hours: Open daily 9 a.m. to 4 p.m. There are now 2 live streaming cameras on top of the Batsto Mansion tower. Go to the above website and get a bird's eye view of Historic Batsto Village! 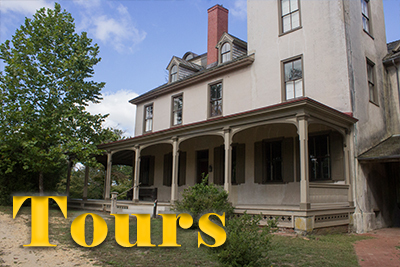 For more information about Batsto Village and tours of Batsto Mansion, call (609) 561-0024. Visitors can also take a guided tour via their smart phone. Accompanied by a walking guide brochure, the smart phone tour highlights 18 historic sites and buildings in the village. Taking the cell phone tour is simple and free. A data plan is required. Visitors simply scan the QR code at each location along the way. A short video and pre-recorded message will play. Each video is approximately 2-3 minutes. This project is supported and funded by the Batsto Citizens Committee, Inc., a volunteer group dedicated to preserving and promoting the site, and was created as an Eagle Scout project. For more information, visitors may stop by the Visitor Center or call 609-561-0024. No Tours on Monday and Tuesdays. Cost: Mansion fees: $3.00 per adult - 12yrs, $1.00 per kid 6-11yrs, Children under 6 are free. 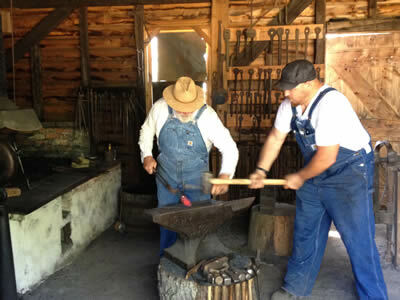 The Batsto Blacksmith Shop is open for live demonstrations on weekends during the spring, summer and fall. Please contact the Batsto Visitor Center for additional details; (609) 561-0024. Batsto Through the Years: A Teaching Resource (PDF 3.84 MB) was recently developed to help educators explain the importance of the New Jersey Pinelands and the lifestyles of the people who lived and worked there. It is the result of collaboration between the State Park Service and the Batsto Citizens Committee, Inc. Topics range from the environment and early Pinelands industry to daily life in the village. The suggested follow-up activities help students make connections between life in the 18th and 19th centuries and the present day. Critical thinking activities challenge students to examine their own community and evaluate how society deals with preservation of historic buildings and open spaces. 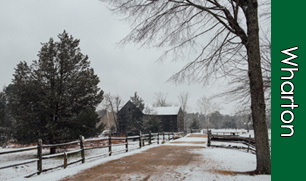 In conjunction with the manual, Batsto Village offers seasonal educational programs and interpreter-led tours. Age appropriate presentations and a “child friendly” museum greet our visitors. For schools unable to travel to Batsto Village, staff and volunteers also offer in-school presentations. For more information about Historic Batsto Village, contact the Batsto Village Visitor Center at (609) 561-0024. Take a tour of historic Harrisville, the remains of a company town located in Wharton State Forest. Isolated deep in the Pinelands, Harrisville is a genuine ghost town from the late 1800's. Once a flourishing village, it was abandoned in 1891 after the driving force of the community, the great paper mill, went out of business. Download and unzip this file and then add the video file to iTunes for your iPod or iPhone. The Atsion Mansion was built in 1826 as a summer home for Samuel Richards. Richards, who a prominent ironmaster from Philadelphia, was the operator of the Atsion furnace along the Mullica River. After Richards died in 1842, the property was passed down through his heirs, and finally sold to another Philadelphia merchant, Maurice Raleigh. The Raleigh family was the last to use the mansion as a residence. When Joseph Wharton purchased the property in 1892, he used the mansion for packing and storage for his cranberry production. The state acquired the property in 1955. Today the mansion appears as it was back in 1826. As such, it does not contain plumbing, electricity, or heat other than fireplaces. The home, unfurnished, is offered as an architectural tour, reflecting on the Greek Revival style of the building. 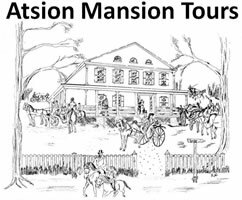 Tours of the Atsion Mansion are available seasonally. Please call the Atsion Office at (609) 268-0444 for more information. 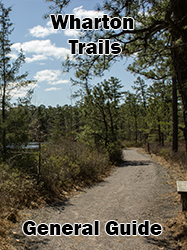 This natural area is composed of two sections bordering the Batsto and Mullica rivers and contains several forest communities that are representative of New Jersey Pine Barrens. Extensive white cedar and pitch pine forests border the Oswego River. This freshwater wetland corridor is home to the rare bog asphodel, Pine Barren boneset, curly grass fern and Pine Barrens treefrog. Swimming facilities are available at Atsion Recreation Area on Route 206 in Shamong Township while lifeguards are on duty. Please check our swimming schedule prior to your visit. For more information call (609) 268-0444. The Recreation Area is open from 9 a.m. to 4 p.m.
After Memorial day, swimming is only permitted when lifeguards are on duty from 10 am to 6 pm. PLEASE NOTE: During the summer months, the park and swimming area may close temporarily if we reach the maximum capacity for visitors. We advise you to call the park prior to your visit to check the status. Inner tubes, rafts and other flotation devices are not permitted in the swimming area. Only Coast Guard approved life jackets are permitted. Pets are prohibited on the beach. Fees: Entrance fees are only charged from Memorial Day weekend to Labor Day. Alcohol is prohibited. Pets are prohibited in overnight facilities with the exception of pet friendly campsites. Atsion campsites: 50 tent and trailer sites with fire rings and picnic tables. Potable water, flush toilets and showers are within walking distance. Please call ahead for campfire regulations. Trailer sanitary station open April 1 through October 31. Campsites open April 1 through October 31. Fees: NJ residents $20 per night; Non-Residents: $25 per night. Godfrey Bridge: 34 tent and trailer sites (21 feet or less), water, picnic tables, fire rings, pit toilets. Please call ahead for campfire regulations. Campsites open all year. New Jersey Residents: $3 per person/per night; Non-Residents: $5 per person/per night. Group Campsites: Sixteen group campsites. One group campsite is located at Batona and contains a hand pump for water and pit toilets. This campsite accommodates up to 15 people. Fee: NJ Resident $30 per night; Non Resident $60 per night. Eight group campsites are located at Bodine Field and have hand pumps for water and pit toilets. Campsites A, E and F accommodate up to 15 people. Fee: NJ Resident $30 per night; Non Resident $50 per night. Campsites B, C and D accommodate up to 25 people. Fee: NJ resident $50 per night; Non Residents $100 per night. Campsites G and H accommodate up to 50 people. Fee: NJ Resident $100 per night; Non Resident $200 per night. Three group campsites are located at Goshen Pond and have hand pumps for water and pit toilets. Campsite A accommodates up to 50 people. Fee: NJ Residents $100 per night; Non Residents $200 per night. Campsite B accommodates up to 25 people. Fee: NJ Resident $50 per night; Non Resident $10o per night. Campsite C accommodates up to 15 people. Fee: NJ Resident $30 per night; Non Residents $60 per night. Four group campsites ate located at Hawkins Bridge. Each site has hand pumps for water and pit toilets. Each site accommodates up to 25 people. Fee: NJ Resident $50 per night; Non Resident $100 per night. Primitive Campsites: Bodine Field, Hawkins Bridge, Batona, Mullica River and Goshen Pond have hand pumps for water and pit toilets. Buttonwood Hill and Lower Forge sites have no water. Mullica River and Lower Forge can only be accessed by hiking, canoeing or horseback; motor vehicles are not permitted. All other areas are accessible by motor vehicles. Please call ahead for campfire regulations. Maximum campsite capacities vary from 50 to 250 persons. Fee: NJ Resident $3 per person, per night; Non Resident: $5 per person, per night. We highly recommend that group leaders carefully estimate their group size so not to over estimate as refunds cannot be made later. Cabins: Nine furnished cabins with screened porch, fireplace, outdoor campfire rings, refrigerator, hot and cold running water, bathroom with toilet and shower; single beds. Cabin #6 contains 2 bunks. Most cabins are designed for people with disabilities. Five cabins accommodate 4 people; three cabins accommodate 6 people; 1 cabin accommodates 8 people. Cabins are located on Atsion Lake. Open April 1 through October 31. From the Friday before Memorial Day through and including Labor Day, cabins must be reserved for seven or fourteen consecutive nights only. From April 1st to the Friday before Memorial Day and from the day after Labor Day through October 31st, cabins may be reserved for a minimum of two consecutive nights to a maximum of fourteen consecutive nights. Mullica River provides excellent boating for electric motors, trailer launch, and cartop launch. Canoeing can also be enjoyed on Mullica, Batsto, Wading and Oswego Rivers. Launching fees are charged on the Mullica River beginning on Memorial Day weekend and ending on Labor Day inclusive. New Jersey Resident $12.00 per Launch. The Park staff offer a variety of historical and natural interpretive programs throughout the year. Contact the park office for a schedule of programs and to register. Program fees may apply.